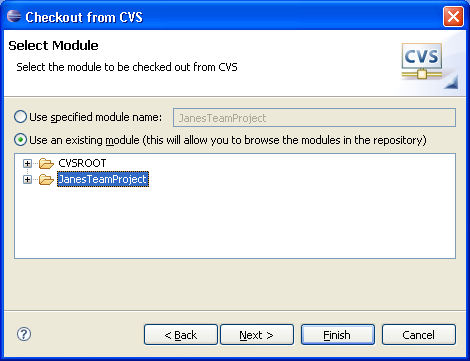 Fred will import the project that Jane committed to the CVS repository into his Workbench. Fred will synchronize and commit his outgoing changes to the two files. Run the import wizard via the File > Import menu item. 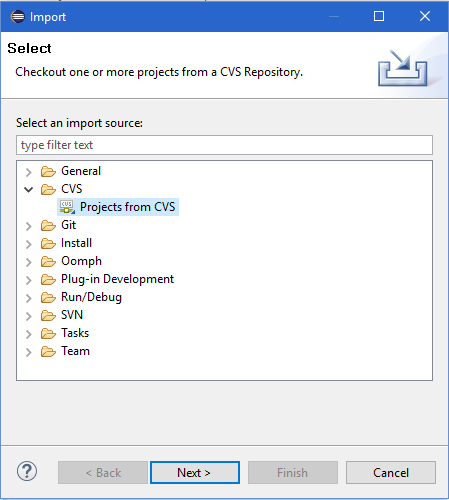 Select the Projects from CVS item and press Next. Create a repository location as described when Jane created a repository. On the next page select the "Use an existing module" radio button and wait while the repository is contacted. 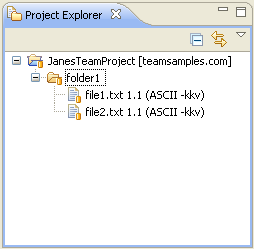 From the list of available projects, select JanesTeamProject and press Finish. A progress dialog will appear showing the progress of the import operation. Open one of the navigation views and observe that it now includes the project JanesTeamProject. Notice that there are CVS decorators indicating the file revisions, the repository name, and the file types.